The NHS is changing rapidly. The development of Clinical Commissioning Groups, the introduction of new provider organisations and the competitive tendering of services are putting increasing pressure on NHS managers and clinicians. This workshop is purpose designed to meet the current needs of managers and clinicians who find themselves involved in tendering within the NHS. 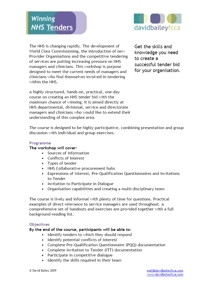 A highly structured, hands-on, practical, one-day course on creating an NHS tender with the maximum chance of winning. It is aimed directly at NHS departmental, divisional, service and directorate managers and clinicians who would like to extend their understanding of this complex area. I have a new member of staff who will be submitting in the first instance our information for NHS Tenders, she has very little experience in this field and I was wondering is she would benefit from attending your course on NHS Tendering? Where are the course held and what are the costs involved?